Icons are age-old but they are here to stay. Imagine Facebook without icons! Need we say more? 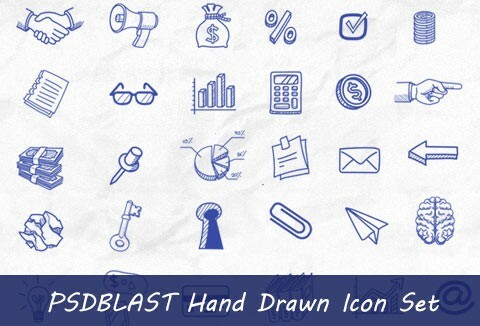 It's time to grab our awesome set of free icons. Icons fit within graphic systems. Whether they are designed for desktop applications or Web sites, an icon is one of many graphic elements that need to work together harmoniously. Carry this logic across icon sets as well. Icons can be appreciated for their aesthetic solutions individually, but they don't function alone. Evaluate your icon designs relative to the graphic system you're using them in. Make sure that each icon differs from surrounding icons, while still working together as a whole. If you go vector and make your icon in Illustrator, there is an inherent temptation to scale the design, and try to use it at any size. This doesn't work with icons. What looks good at 512px looks like a blurry smear at 16px. Icons should have a base design that is used as a starting point, but each output size needs to have its own optimized design. Icon design is not a one design equals scalable solution medium though. This is one reason that Photoshop is just as good a solution as other programs. For designers that make icons in Illustrator, they are still going to clean them up in Photoshop, or jump through some hoops to get their icons to look good at small sizes when being output directly from Illustrator. All vectors can be used for both commercial and personal purposes. You are not permitted to redistribute/re-sell the actual vector files. Nice, and the price is right. Merci, très heureuse de ces icones ! beau travail ! Snazzy little icons. Useful and this time FREE. Neat but why are they on a blue rippled background? Clean, simple icons for a great price! Simple icons, great price. Each icon is on its own layer, easily exported, so no need to worry about the background. Thank you so much Lisa.. glad you liked it. Thanks so much!! Love them! You are welcome Laura… stay tuned.. coming up more such great deals.. This icons are great, lov’em! Thank you for this great deal! Great Icons for free!! Can’t beat that!